Are you singing that song from book of Mormon, “turn it off, like a light switch?” Immediately my sound track! One suspects that the cheerleaders and Mormons caused less trouble than the Teach for America summer program does. No, I remember those cheerleaders. They were trouble. True story. I was in high school and that summer I took a six week intro to engineering class at Rice. Mormons and Cheerleaders what a combination. We were RAs at Brown when the US Olympic Festival came to town in the mid-80s. We had the gymnasts and synchronized swimmers. Quite a change from the college’s normal inhabitants. In the 60s Rice had no summer school because of the lack of air conditioning in the men’s colleges. 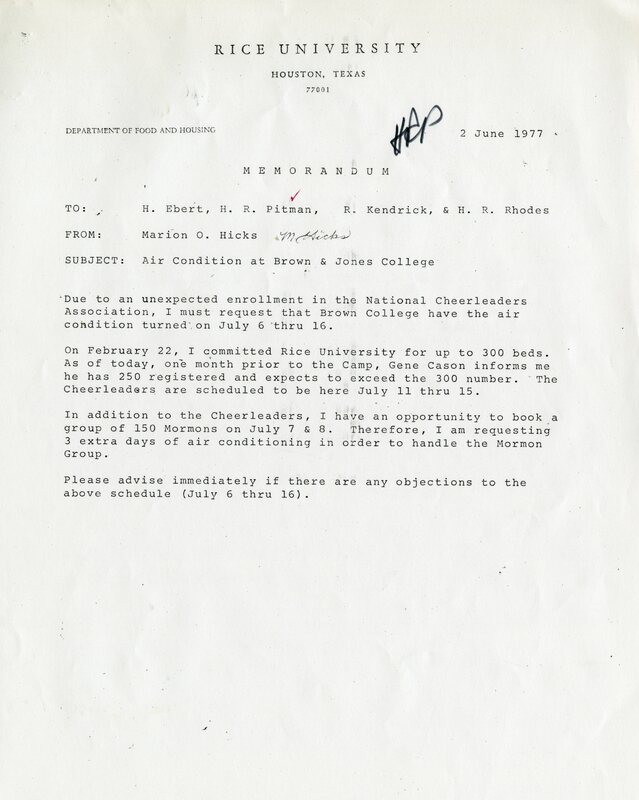 They did rent out the women’s colleges for events like the Olympic Festival, cheerleaders school etc. But for Rice men who were temporarily in Houston in the summer for something Rice -related, they kept part of one of the un-aircondioned men’s colleges open. I had surgery on my knee for a track injury, and had a followup doctor’s appointment and testing. I stayed in Will Rice for two nights in July 1964 in high 90s Houston humidity. Talk about HOT! When I was recruited out of high school in 1972 for basketball, the coaches showed me a slick book which contained a picture of the air conditioned Astrodome and which described Houston as the “world’s most air conditioned city”. They did not tell us that Autry Court was not air conditioned. When we began lengthy practice sessions on October 15th, we sweated so bad that we had to change shoes and socks several times because we left continuous trails of perspiration on the floor. Our consummation of Go Juice (a locally prepared Gatorade concoction) was close to a gallon per person per hour. Autry Court was not air conditioned for another 15 years.